AT&T Inc. (T), together with its subsidiaries, provides telecommunications services to consumers, businesses, and other providers worldwide. This dividend aristocrat has paid uninterrupted dividends on its common stock since 1984 and increased payments to common shareholders every for 28 consecutive years. The company’s previous name was SBC Communications, but after acquiring legacy AT&T in 2006, assumed the name of the legacy telecom giant. The company’s last dividend increase was in December 2011 when the Board of Directors approved a 2.30% increase to 44 cents/share. AT&T ‘s largest competitors include Verizon (VZ), Sprint-Nextel (S) and Deutsche Telecom (DTEGY). Over the past decade this dividend growth stock has delivered an annualized total return of 2.50% to its shareholders. The company has managed to deliver zero growth in EPS since 2002. Analysts expect AT&T to earn $2.36 per share in 2012 and $2.54 per share in 2013. In comparison AT&T earned $2.20 /share in 2011, before several onetime charges (discussed below). Fourth-quarter 2011 net income attributable to AT&T totaled $(6.7) billion, or $(1.12) per diluted share. Excluding significant non-cash charges of $0.65 from the actuarial loss on benefit plans and $0.48 for directory asset impairments, along with a one-time charge of $0.44 for termination of the T-Mobile USA acquisition and a one-time gain of $0.03 from a tax settlement, adjusted earnings per share was $0.42. existing network equipment and maintain service. One differentiator for customers looking to switch is the type of phones a telecom carrier offers. AT&T was the exclusive carrier in the US for the iPhone until 2011, when both Verizon and Sprint added it to their line of phone offerings. Unfortunately, it is difficult to predict the next big thing in phones, which will drive customers to stick to a carrier for a longer period of time. 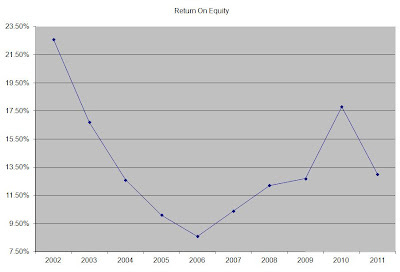 The company’s return on equity has been on the rebound since reaching a low of 8.60 in 2006. Rather than focus on absolute values for this indicator, I generally want to see at least a stable return on equity over time. The annual dividend payment has increased by 5.40% per year over the past decade, which is higher than to the growth in EPS. A 5.50% growth in distributions translates into the dividend payment doubling almost every thirteen years. If we look at historical data, going as far back as 1984 we see that AT&T has managed to double its dividend every fourteen years on average. 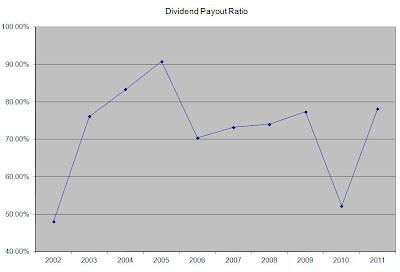 The dividend payout ratio has consistently remained above 50%. The company is essentially distributing almost all of its earnings back to shareholders, leaving little room for future growth. A lower payout is always a plus, since it leaves room for consistent dividend growth minimizing the impact of short-term fluctuations in earnings. Currently AT&T is fairly valued at 13.80 times earnings, has a very high dividend payout and yields 5.80%. I do not plan on initiating a position in the stock.